Willie Finnegan of the Monaghan County Association Birmingham joined us at our Tuesday night practice on the 2nd February to donate £500 to the band. The Monaghan Association was a very busy association raising thousands of pounds over the years for many different charities based in Birmingham. Our previous Pipe Major Frank Brennan was a leading force in the association along with Willie Finnegan and Frank was a founding member of the Birmingham Irish Pipes and Drums. The donation is very welcome and will be put into very good use. It costs around £5000 per year to fund the band for uniform and playing equipment and as we lead up to the St Patrick’s Day Parades our expenditure increases to ensure we look and sound as good as possible. The Monaghan Association no longer meets and after meeting with former committe members Willie decided that the funds still in the bank account should be put to good use rather than sitting in the account and paying fees every month. We were very glad to be one of the causes chosen for a donation along with Sister Sabina’s Fireside charity. 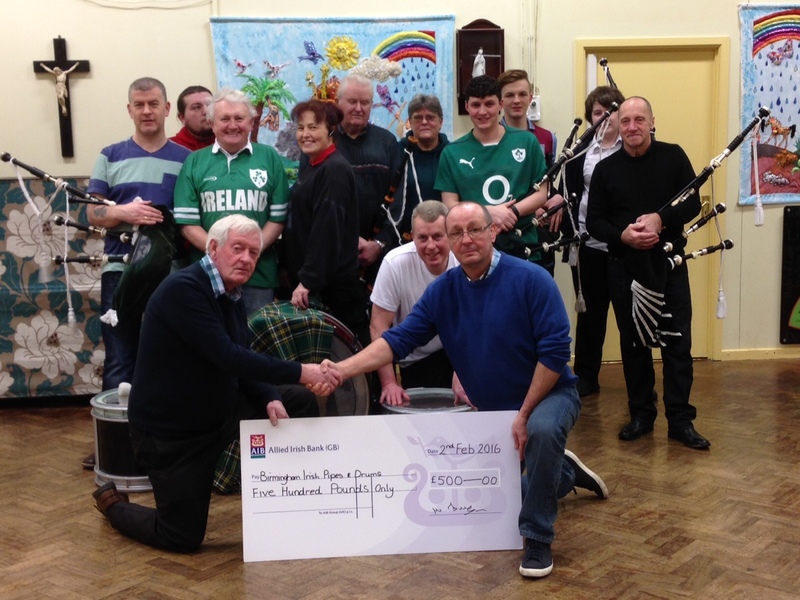 Willie Finnegan presenting the cheque fro £500 to Pipe Major Bill Grigg and the rest of the band at practice. Sunday the 8th November saw us marching round the streets of Kingstanding Birmingham as we marched veterans, those serving, cadet corps and scouts and brownies and many others from Perry Common British Legion No.1 to the Remembrance Day church service and back again on a mild and unusually warm November morning. We have proudly led the Perry Common RBL around these streets for at least the last 9 years and they always make us feel very welcome, They are a great bunch of people and the first question we get asked at the end of every parade is can we do next year? The answer is always yes. At the end of this years parade it was Joel Grigg who played at the laying of the wreaths and he played a really great rendition of ‘Mist Covered mountains’ a truly amazing slow air. A very well done to the band for its’ performance at The All English Pipe Band Championships held at Chatsworth House on Sunday 6th September. We came 3rd in our grade (4b) on the day out of 6 competing pipe bands. As the new guys and gals on the block we are still learning loads about competition and we were really pleased with our result. Since then we have had a change in our Drum Corps line up with a new Leading Tip and I look forward to developing a great sound between the Pipe Corps and the Drum Corps. Something i know that the whole band is looking forward to. We are working hard on tunes for the St Patrick’s Day Parades that we will be playing in March and also on a new competition set that will be a move from our previous 4/4 set to a 2/4 set. We have just finished the Huddersfield St Patrick’s Day Parade that was held on Sunday 8th March. As usual we received a great welcome from the Huddersfield committee and a great (if slightly damp), day was had by everyone. Maurice Long had organised the coach which firstly picked up from the Irish Centre in Digbeth at 8.30am and then SS Mary and Johns in Erdington at 9am. 4.30 pm and we were back in Brum by 7pm. A great day and thank you to all that contributed, both playing and non-playing. 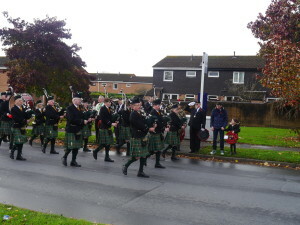 I hope that all that joined the band for a day out really enjoyed themselves. 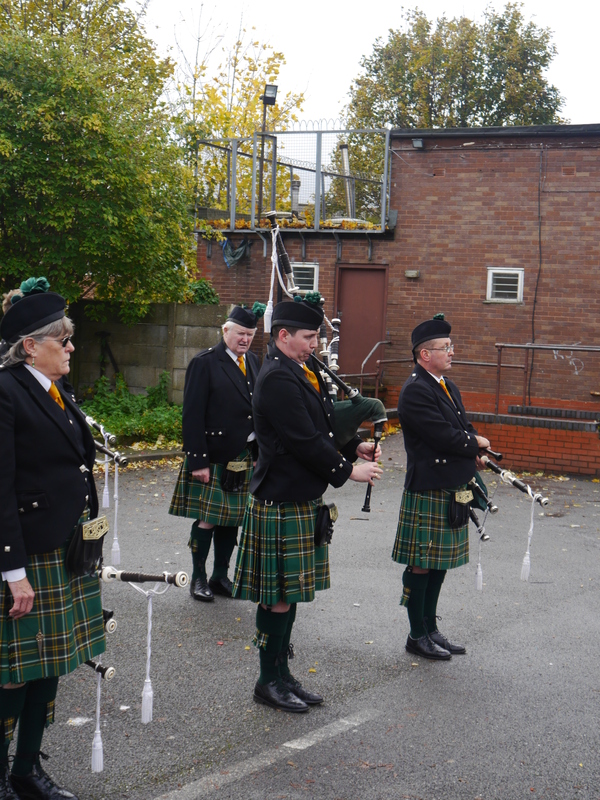 We have a busy period coming up with The Sandwell St Patricks’ Day Parade at 10am on Saturday 14th March. Straight to Derby for their parade at 12.45pm and then the Birmingham St Patricks’ Day Parade that starts at midday on Sunday the 15th. We are all looking forward to these events and all the fun that goes with them.